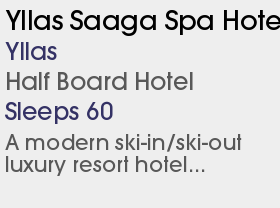 WEsay The perfect Lapland experience with its sensational unspoilt natural scenery and so much to offer on and off the slopes... including Santa! Whether it's a Santa Break, a Snow adventure, a chance to see the Northern lights, or perhaps just the appeal of skiing a new destination, Yilas really does have something for everyone! 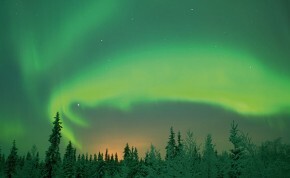 The skies here are particularly clear, and ideal for observing the legendary Northern Lights. The resort is made up of two Lappish villages about 15 minutes apart and connected by a resort shuttle bus: Äkäslompolo where Äkäs Hotel and our cabins are located, and Ylläsjärvi where the Ylläs Saaga Spa Hotel enjoys a popular slopeside position. A wide range of exciting activities are available including horse-riding, arctic ice fishing, snow laser quest, northern lights trips, beginner and intermediate snowshoe safaris, wilderness dinners, fat biking and in December, you can also meet Santa of course! The apres ski is friendly if not raucous. Ylläs is particularly appealing as an alternative family holiday: a short transfer from Rovaniemi. For the skier, there are some of Finland’s longest ski slopes within it's largest ski area, as well as some excellent cross-country trails too. The mountain’s two gateways are both 4km from the lifts spanning both sides of the mountain. Ylläs is an excellent resort for beginners, offering gentle nursery slopes and confidence boosting blue runs. Intermediates can practice their turns on a good choice of red runs, some of which are illuminated and open every evening. The more experienced could take a guide and head out into some of the most challenging terrain that the mountain has to offer, whilst boarders have plenty to keep their interest with a range of parks and pipes. A new gondola lift on the Ylläsjärvi side. December charm for those looking for Santa, along with a wider appeal all winter for skiers and non-skiers alike. Winter wonderland - ski through frozen trees or observe local wildlife on a snow safari. One of the largest ski areas in Finland, with over 60 slopes.